In case you haven’t had the good fortune of trying deep fried turkey before, we’ll give it to you straight. Deep fried turkey is seriously delicious. And by delicious, we mean quite possibly the best thing you’ve ever put into your mouth. Seriously. Crispy skin, moist juicy meat. It’s real good and your friends and family will keep coming back for more every single year. Outdoor oil turkey deep fryers are what you traditionally think of when you hear, “deep fried turkey.” They run on propane and involve a big pot of boiling oil in which the turkey is immersed. Depending on the model you buy and the size of the pot, these outdoor deep fryers can cook turkeys of 25+ pounds. The indoor oil fryers make a great alternative to the outdoor turkey fryers when you live in a cold climate that doesn’t allow you to cook outside around Christmas or Thanksgiving. They are generally considered a bit safer than the outdoor oil fryers as well since they are enclosed and sit on the countertop instead of a stand above the ground. The big negative about the indoor oil fryers is that they have a maximum turkey size of around 15-20 pounds, depending on the model. We strongly recommend the indoor turkey fryers from Butterball. They’re top-quality machines at an extremely reasonable price and should last you for many, many Thanksgivings to come. If you want to go healthy, you’ll need to consider an outdoor air fryer. They most often use infrared heat to get that crispy on the outside, juicy on the inside taste and texture. One of the best things about air fryers is that you can add wood chips to them for a smoky flavour. There is also a drip tray which allows you to catch the drippings which can be used to make gravy. Although the taste is not exactly like deep-fried, the results are certainly more delicious than baking your turkey in the oven! Our top-rated outdoor air fryer is the Char-Broil Big Easy. It cooks up a turkey that tastes strangely deep fried, but at only a fraction of the fat and calories. Finally, you can also air fry a turkey indoors. These fryers and roasters are usually for small turkeys only and you’re not able to add wood chips to them due to the smoke. However, they’re a great pick if you live in a cooler climate and want to free up some oven space for that next big family celebration. Go healthy with some air frying for your next holiday family feast. We recommend the Big Boss 1300 Watt Oil less Fryer. Good News: Turkey Frying is Easy! The good news is that it’s super easy to deep fry turkey. See: How to Deep Fry a Turkey. A few years ago, one of my family members deep fried a turkey while another one cooked a turkey the traditional way in the oven. We ate them side by side and compared. The final verdict of this delicious comparison? No comparison at all-the deep fried turkey was far, far more delicious. And not that the person who baked the turkey didn’t know what she was doing-her turkeys are great, for being cooked in the oven. Trust us. You really just need to try deep fried turkey once to know how much you’ll want more, and more, and more each and every single holiday possible. Be the hero of your next family celebration with a turkey deep fryer. Yes, it really is that easy to be loved at that next family celebration. Isn’t Deep Frying Turkey Dangerous? I know you’re thinking to yourself right now, “Isn’t that really dangerous to deep fry a turkey?” Yes, it can be, especially if you don’t have the right equipment. Just about the worst thing you could possibly do would be to DIY some kit that you’re thrown together with junk you have laying around your backyard. A huge pot of boiling oil in a thin pot on a wobbly stand? That’s truly terrifying and should be avoided at all costs. But that’s what this website is all about-turkey frying equipment so you can do it safely and awesomely, whether that’s in your backyard, or inside your house. It’s time to get your deep fried turkey on in style with no injuries of any kind! Make that next Thanksgiving or Christmas feast the best one yet with some turkey deep frying deliciousness. If you live in a warm climate, an outdoor oil fryer is a great choice. Even in a cold climate, a turkey deep fryer could be used for most of the year. The best part about it is that you can free up oven or counter space on those busy family holidays. Basically, you fry your turkey in a huge pot (either aluminum or stainless steel) on a propane burner. You can get a complete kit with everything you need, or just the burner and then a separate pot. We recommend the latter because the pots that come with the kits are often pieces of junk. Complete Propane Turkey Fryer Kit with Aluminum Pot. It’s real cheap and will get the job done, for at least a couple rounds of turkey frying. The reviews on Amazon mentioned that the pot, as well as the stand aren’t the most durable things ever built. But if you want to get a cheap kit for that one special occasion, this one is a good choice. This turkey frying kit from Kamp Kitchen is specially designed for frying turkeys and comes with every single thing you need to get started. If you like easy, right out of the box, this turkey frying kit is certainly that. High Pressure Outdoor Gas Cooker + Stainless Steel Pot. If you want a turkey frying set-up that will last you for years, this one is it. This outdoor gas cooker and stainless steel pot set-up is far and away much higher quality than the cheap kits you can buy. If you love deep fried turkey and plan on doing it every single holiday for the foreseeable future, this belongs in your backyard. This outdoor gas cooker from Bayou Classic is the best money can buy. People have used these outdoor gas cookers for years and love them. Bayou Classic is one of the most trusted names in outdoor deep frying and for good reason-they have great products at very reasonable prices. Stainless steel pots are extremely durable, easy to clean and basically the perfect thing for deep frying turkey, or just about anything else for that matter. Indoor oil fryers are very easy to use and are perhaps a little bit safer because they sit on a countertop instead of a stand and are fully enclosed. The negatives to them are that they do give off a bit of heat while cooking, take longer to heat up than propane kits, and they also take up a lot of space on your countertop and while being stored. However, if you’re a family that loves to deep fry, and you love deep fried turkey then it could be a great choice. All the indoor turkey fryers can be used to deep fry a million and one other things. They are also great if you live in a cold climate (Canada!) and want to deep fry turkey at Thanksgiving or Christmas. If the air temperature is too cold, it’ll be pretty difficult to get the oil up to the correct temperature without burning through a ton of propane. In this case, an indoor oil fryer can make a much better choice for you. MasterBuilt Butterball Indoor Electric Turkey Fryer. This is a powerhouse of a turkey frying machine. Masterbuilt Butterball is by far the most trusted name in the indoor turkey frying space and their machines have a great reputation for doing exactly what they’re designed to do-for years and years. This top quality indoor turkey fryer comes with some of the highest ratings in the category on Amazon and also cooks the largest turkeys (up to 20 pounds). Priced at around $100, it offers some serious value for the money. We love this thing and we’re sure you will too. Plus, we think you’ll end up finding a ton of other uses for this thing, apart from turkey! Let’s jump to the space age for a minute. This outdoor air fryer that we’re going to tell you about uses infrared technology to cook turkey in 8-10 minutes per pound. Yes, that’s right. A 15 pound turkey can cook in as little as 2 hours. Amazing! That’s about 1/2 the time it takes to cook a turkey in a traditional oven. Plus, it makes the turkey taste really, really delicious. Although it doesn’t use oil, it produces that deep fried turkey taste and texture. If you’re looking for healthy, but have some sort of dietary restriction on fat or calories, this might just be your best bet for roasting a turkey. We think that every single person should have one of these. It’s that good. Seriously, people love this thing. Plus you can cook roasts, vegetables and a whole host of other things with this one. Get your frying on, minus all the oil and calories! Last but not least for turkey fryers are the indoor air ones. If you’re looking to free up some oven space on that big family occasion, an indoor air fryer is exactly what you need. However, be warned. If you’re looking for that deep-fried taste, these ones will not give you that. They taste similar to oven roasted turkey, but the turkey cooks more quickly (10 minutes/pound, 2.5 hours/15 pound turkey). The Butterball Oil-Free Electric Turkey Fryer and Roaster is a great choice for indoor turkey fryer. It has an excellent rating over on Amazon and can cook up to 18 pound turkeys, which is more than most of the other indoor turkey deep fryers. It has an extremely powerful 1650 Watt cooking element and can cook a ton of other things besides just turkeys. If you have the space in your house, it’s an excellent kitchen appliance to keep in your back cupboard for those big family celebrations when you have a ton of stuff going on in your kitchen. The best thing about these indoor air fryers is that you put the turkey in it and then forget about it. Come back a couple of hours later and you’ll have moist, delicious, flavourful turkey at a fraction of the fat and calories as the deep fryers. If you’re looking for some solid advice about how to deep fry your turkey safely while making it really delicious, then you’ll need to check this out. It’s everything you ever wanted to know about deep fried turkey. 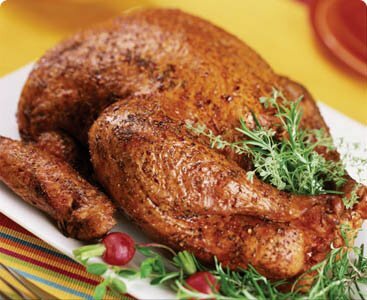 Recipes, deep frying a turkey safely, different kinds of pots you can choose, turkey frying accessories, seasoning pack reviews and more. Also be sure to check out this popular article: How Long to Deep Fry a Turkey. Or, perhaps you’re looking for a pot to deep fry your turkey in? Not sure whether a stainless steel pot, or an aluminum pot is for you? You’ve come to the right place! We have our top recommendations listed here for turkey frying pots.